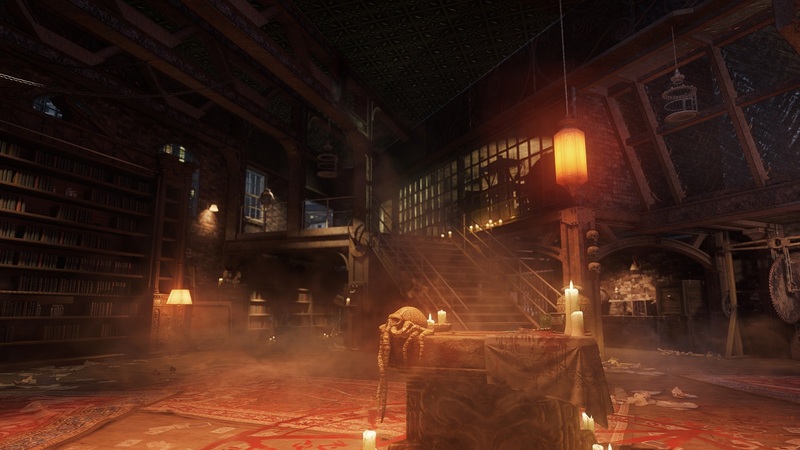 Alrighty, So I'm hearing a lot of people call the new special zombies "Aliens," but I just don't think that's the case. Naturally, as this map is "connected to MotD" in some way, my initial thought turned to something more demonic. I think that most people saw a resemblance between these creatures and those of extinction, but I believe they were more so inspired by Lovecraftian horror. 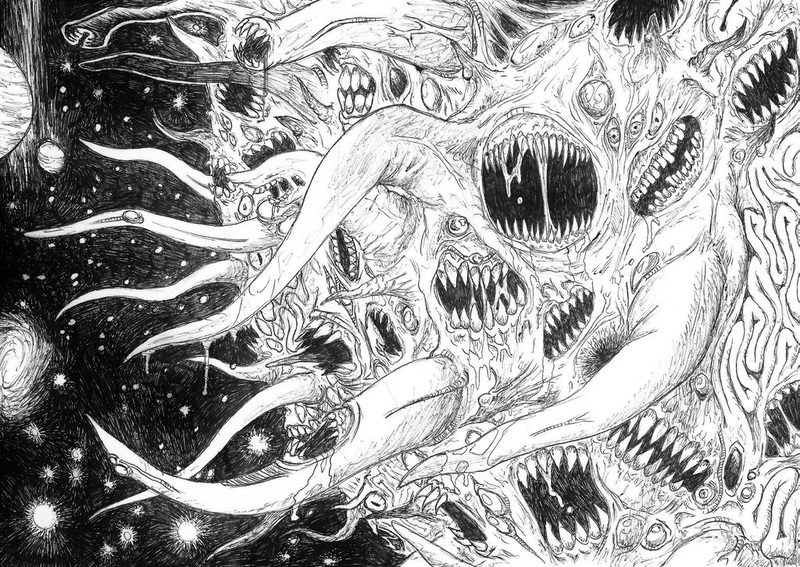 "Lovecraftian horror is a subgenre of horror fiction that emphasizes the cosmic horror of the unknown (and in some cases, unknowable) more than gore or other elements of shock, though these may still be present. It is named after American author H. P. Lovecraft (1890–1937)." You're probably familiar with some of the creatures of Lovecraft or at least their general style. Here are a few notable examples. These are kinda "extreme" examples but I think you can see how they bear resemblance. Look at the skull on the table. Need I say more? Within the Lovecraftian fiction, The Great Old Ones are malignant entities that possess great power and are physically present on the earth. These are linked to Christian Gnostic ideology such as the concept of the Demiurge. 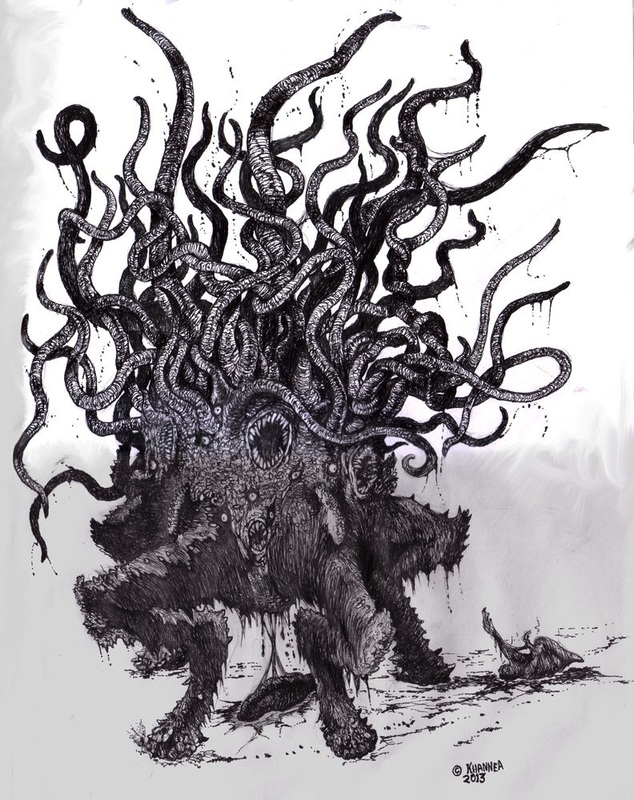 My thoughts are that since Lovecraft fiction has its entire creation myth separate from christianity, and MotD already embraces the more conventional model for hell, these creatures are demonic in nature, aesthetically and behaviorally drawing influence from Lovecraftian Imagery. As a bonus, may of you know that TheSyndicateProject hosted the San Diego panel at which these trailers were first displayed. He claimed in his Zombies Twitch stream the previous day that he already had loads of "Forbidden information." He also posted a snapchat, in which he simply said something to the effect of "You don't know anything. Only the cursed survive." So I'm thinking he is "in on it" as they say. This to me already matches the Lovecraft art style, but for the life of me I can't tell what this is actually depicting. Syndicate said in the video description: "The Marked Ones wouldn't want you to miss anything." If we've got any scavengers out there who can dig something up on the image. The image obviously links to the moon loading screen, I am guessing we are continuing from there in some way. UPDATE: So I'm giving credit to MrDalekJD for identifying that image, and it turns out it's part of the album art for a band called Holy Mountain, and their song Ancient astronauts. hmmmmm. Long shot, but the term Ancient Astronauts might actually be relevant to our story. The ancient astronaut or ancient alien hypothesis is a pseudoscientific hypothesis that posits that intelligent extraterrestrial beings have visited Earth and made contact with humans in antiquity and prehistory.Proponents suggest that this contact influenced the development of human cultures, technologies, and religions. 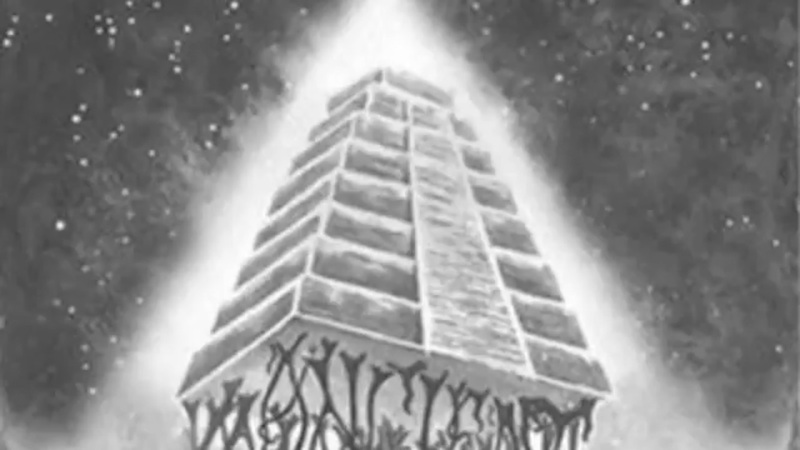 Even the temple in the cover we've seen before, it's called a ziggurat. Ziggurats (/ˈzɪɡəræt/ zig-ər-at; Akkadian ziqqurat, D-stem of zaqāru "to build on a raised area") were massive structures built in the ancient Mesopotamian valley and western Iranian plateau, having the form of a terraced step pyramid of successively receding stories or levels. This temple is also actually hovering in the air, with bright light all around and above, which is definitely something we've seen before. Thank you for noticing the similarities between the "alien" and the Lovecraftian Eldritch horros. Anyway, it's obvious Syndi knows something that the general community does not. I mean, he's basically their new way of advertising along with other CoD YouTubers. The pyramid definitely bears a resemblance to the ones found in Shangri-La and the Moon loading screen. So, firstly, the "Ancient Astronauts" theory is the idea that early civilizations received aid and visitations from extra-terrestrial beings (aka aliens). In regards to Zombies, this goes with the theory that the MPD was created on the Moon via aliens. This could mean that the power and the entrance to Agartha were created by these super beings. Secondly, the Shangri-La pyramid that we see getting transported between the Earth and space. What does this have to do with the AA theory? Well, like I said, it's entirely possible that although Shangri-La was in all actuality a Group 935 base, it could have had some link to these extra-terrestrials in the past. I'll admit, my knowledge of the lore being Shangri-La is poor, so I don't really have much else to say for now. But really, I don't think that there's a link between SOE and these "Ancient Astronauts." At least, not yet. EJ, yes man yes! He is back the electric one! But anyway I was with everyone else thinking these "things were aliens or some extinction non-sense but then in person we talked about this abd you mentioned some sort of demon or monster and it clicked because of the MOB connection. Glad to see you back here where you belong posting your Anazing topics let's see if you can retar your UOTM. We have been hinted about aliens and their involvement for a long long time. From the Vril saucer craft blueprints in Der Riese to AVRO craft in Ascension radios, Vril generator and the Ray Gun itself. It seem they decided to to go with the H.P Lovecraft style monsters and mythology to introduce us to these residents of Agartha. 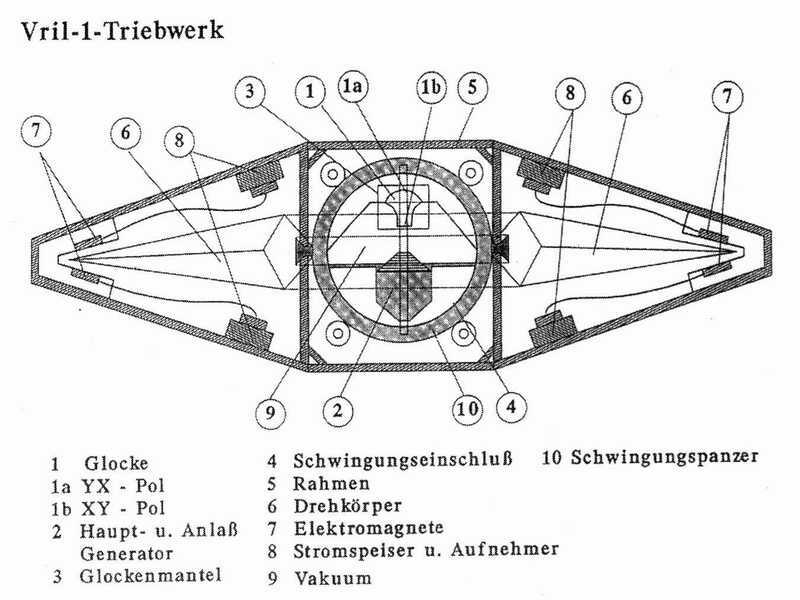 I feel they fused it to the Vril and Thule occultisim we already had in the story. His skull is on that alter with that ball on so quite possibly yes in the future. well technically Cthulhu's skull is large enough for a family to live in, but that looks like a smaller version of roughly the same. I think the current boss for SoE is basically supposed to be just that, more or less. It's interesting that people connected the SoE creatures to Extinction, as those Cryptids aren't actually aliens at all, but ancient subterrainean creatures that existed even before the dinosaurs. Naturally ancient underground advanced species screams Vril, but it's a but different in zombies. Bear in mind that the MPD was on the moon before humans had ever even been into space. People talk about Vril and aliens as if they are one and the same, which they very well could be. I'm not getting into that whole deal now though. The Raygun is already rumored to be initially invented by Aliens, so we've already seen the American wonderweapon program advancing due to extra-terrestrial influence, although that isn't exactly ancient, although I believe it's the earliest "confirmed" indirect interaction between humans and aliens within the story, apart from the potential Shangri-La ancient aliens. Additionally the MPD could have been on moon for years before it was discovered. There are creatures of Lovecraft that dwell in space of course, although as I said, the zombies universe may merely be paying homage to them aesthetically, without "them" actually being there. Anyway, I'm really dying to see a shot of a character transforming into the weird tentacle beast power-up from 3rd person. I'll post a few pics of the lovecraftian imagery from the trailer in a moment. Still, I'm getting a more demonic type vibe than an alien one from Shadows of Evil. That skull and that boss are nothing alike. The Raygun was made by a member of Group 935 named Henry Porter, from plans taken from the rising sun facility and a project started by Maxis. Also that boss looks a lot like a nova crawler mixed with something lovecraftian more than an alien. Can you type in another colour because it is really hard to read? Personally I think just like how MOTD had a catholic dante boss(s) with the 3 dog heads and brutus. The lovecraftian boss is more cthu-lic. More tentacles, less hell-hound-esque. It's a solid concept when dealing with a "Hell" map, as we arn't sure which depiction of hell is correct. You're right about the raygun, my bad, don't know what I was mixing that up with. Although I don't think Porter created the original Raygun as he is an American, and he is merely responsible for those variants that adopt his name. (Mk2 and X2.) Also for the record quite a lot of lovecraft's creatures are from space, so alien and lovecraftian are not mutually exclusive. Also sorry about the text, apparantly that's the default on mobile? I'll try to fix it. I do agree with you @Stop Mocking Me0 asthere are naturally many different interpretations of "hell" or "demons" in real life, and zombies has already acknowledged the more conventional christianside of that. It's interesting to see what other religious / mythological / fictitious elements they are going to pull into the Zombies Canon, as it looks like (hopefully) some degree of lovecraft is working its way in. By the way I wasn't implying that the skull on the table is literally the skull of the boss, just that it's more or less the same type of creature in an aesthetic sense. It's fiilling in that abomination archetype in the same way a Cthulhu boss would. Porter is american? Where does it say that? Also yeah the plans for the Raygun were found at SNN and then Maxis began to actually make it. Lovecraftian lore should hopefully help tie both the Alien and Hallow Earth threads in the storyline together. The earliest "Ancient Aliens" type of theories I know about was from Erik Van Daniken's "Chariots of the Gods" documentary. Might be a good idea to revisit that material, especially the parts focused on Vimanas (flying pyramids). "The marked ones wouldn't want you to blink.. "
Here's the song for Holy Mountain "Ancient Astronauts". Can anyone make out the lyrics? Oh I just got it, the Marked Ones are the characters with that new symbol marked on their hands. What if the Only the Cursed Survive theme carries on this game and follows the O4 as well?